Why did I write extensively in the prior post about FOFB (the Fear of Falling Behind) and FOMO (the Fear of Missing Out)? Because these are the two obstacles that keep people in a perpetual state of ramp, of threat, of intimidation, worrying, hence alternating between states of anxiety or anger & depression. 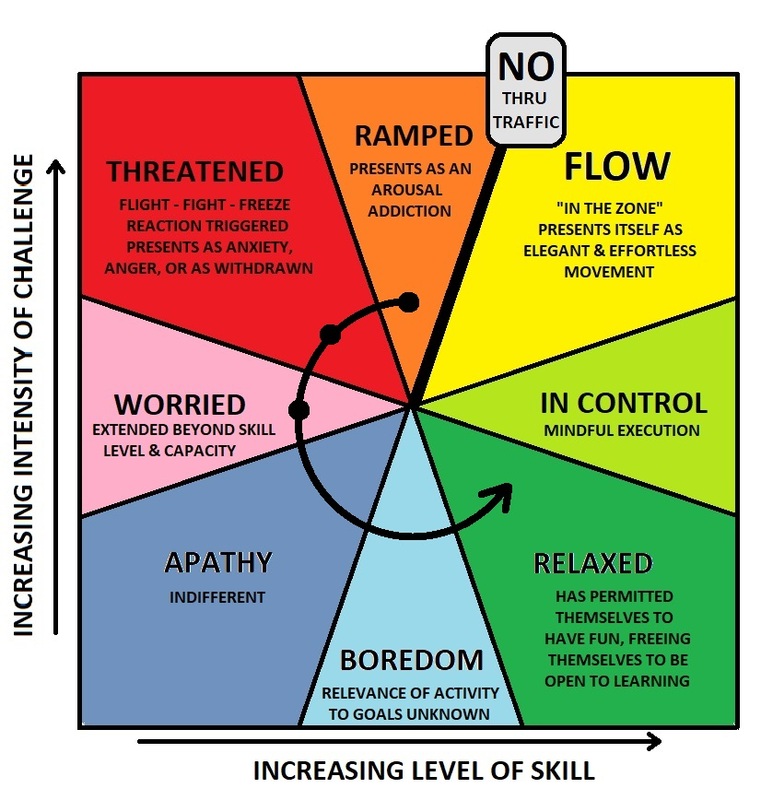 If we refuse to stop caring what other people think, if what other people think is what we are going to hold onto as the metric and criteria for how well we are doing in life, then there is no way to move from being externally motivated (left side of FLOW pinwheel) to internally motivated (right side of FLOW pinwheel). We cannot have it both ways. We pretend that we can, we hope that we can but deep down we know it doesn’t work that way, never has, never will. No matter how many vacations, spa visits, cottage or retreat weeks, or days off from work are taken, nothing is ever going to truly allow you to relax; because you know that the moment you take that foot off the gas pedal, in the back of your mind… those two monkeys – FOFB and FOMO – are going to repeat to you over and over: “you’re falling behind”, “you’re missing out” until they elevate your level of panic to the point you feel forced to jump back into action. You can fight the feeling, you can numb yourself to the feeling [with booze, drugs or distractions such as your device], but not until you stop caring what other people think will those two monkeys ever be shaken off. There is no short cut from living Ramped, Threatened or Worried to Relaxed… everyone has to pass through Apathy & Boredom on their way to Relaxed. Its why we watch the best of the best in any arena: we know that everyone who stands as a consistent peak performer be it in athletics, academia, or the arts at some point had to decide between their dreams, their goals, their path in life, or the path of caring what others think and mindlessly copying what others do. What they chose is evident to all; how they did it… now that is what we are truly trying to get a glimpse off… how did they stop caring what everyone else thinks? The decision they made to be able to free themselves and experience their greatness, is the exact same decision you have to make to experience your own greatness. And, I truly believe that greatness exists within each and every one of us. The only question is… what will you decide to do?